From left: Student Protocol Director Wanda Muhammad, MGT Student Coordinator Shante X, Student Youth Minister Yasin Muhammad, Tampa Study Group Coordinator Chad X, Tampa Study Group laborer Michael X and FOI Coordinator Daniel. 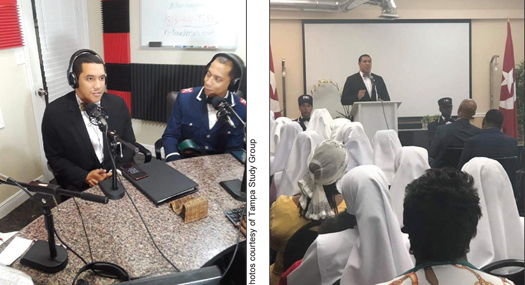 TAMPA, Fla.— The Nation of Islam Tampa Study Group recently hosted a Youth Sunday event. They invited Student Youth Minister Yasin Muhammad of Muhammad Mosque No. 29 in Miami, under leadership of Student Minister Patrick Muhammad, Seventh Region Representative of the Honorable Minister Louis Farrakhan. The audience listened intensely while he delivered the Word of God from the teachings of the Most Honorable Elijah Muhammad. Brother Yasin was also present for a Table Talk dinner with area youth. He wisely encouraged the youth on the importance of connecting with Allah (God). He then was a guest on N-Touch Radio station speaking about the rise of youth. “Major thank you to Bro. 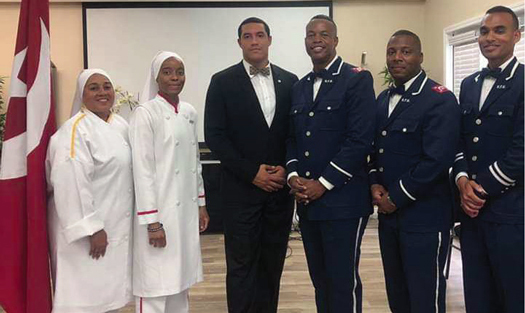 Chad and the Tampa Study Group for the opportunity to share words from the teachings of the Most Honorable Elijah Muhammad and the Honorable Minister Louis Farrakhan and be in the company of the believers,” Bro. Yasin Muhammad posted on his Facebook page. Student Youth Minister Yasin Muhammad (left) on N-Touch Radio in Tampa. “I was blessed to be a part of a table talks, a radio show, and delivered the main lecture on Sunday all within 24 hours. All Praise is due to Allah for those opportunities! We must work harder and harder to spread the truth for the liberation of our people. I thank Allah as a student of the Honorable Minister Farrakhan for this experience! Everything I say of truth I learned from that great teacher. The believers in Tampa are absolutely beautiful, I love their spirit and look forward to next time,” he added.